America's suburban migration, once dominated by families in search of a better living environment, is undergoing a metamorphosis. 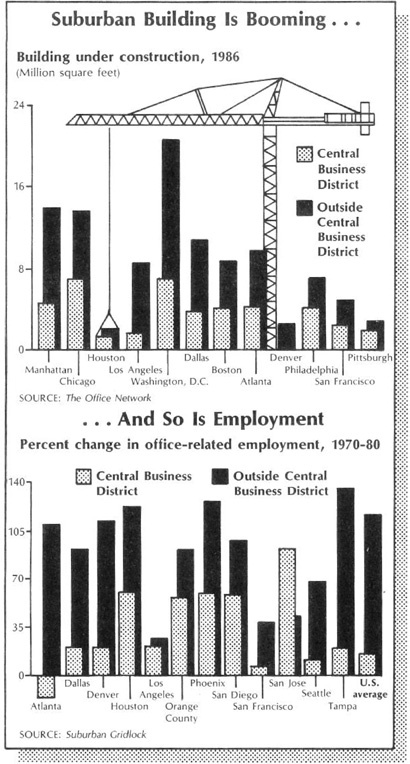 In unprecedented numbers, firms are also leaving downtown central business districts for outlying areas. But unlike the residential migration, which took place gradually over the first 60 years of this century, today's corporate migration to the suburbs is happening at a dizzying pace that is causing major traffic, housing and employment disruptions on the suburban landscape. “In the late 1970s and early 1980s, central business districts accounted for more than half of the office space in the country,” explained Kathryn S. Gehbauer of the Office Network, a Houston organization that tracks business construction trends. “Now it's the other way around, with 57 percent of office space located in the suburbs.” According to the organization's survey, more than half of all new office building since 1981 has occurred in the suburbs. Some of the new “suburban downtowns” also called “urban villages” and “suburban employment centers” are overshadowing their parent cities in economic importance. City Post Oak, an office and retail development located six miles from downtown Houston, has a daytime population of 85,000 and would be the 10th largest downtown in America if it were incorporated as a separate city. The Coastal Corridor, a 16-square-mile suburban business district surrounding Los Angeles International Airport, is expected eventually to surpass downtown Los Angeles in size and density. Tysons Corner, where office buildings have sprung up around a regional shopping center in the Virginia suburbs of Washington.